Time is truly the most valuable currency we have. The more we spend of it, the more the grains of sand drop through the hour glass. All of us truly don’t know who many grains of sand we have in that hour glass. But regardless of the number, they keep falling through and landing on the bottom. One grain less. One day less. The more we try to hold onto it, the more it slips out of are hands. The harder we grasp, the more it resists. We are the masters of our fate. But how we use our time depends on that fate. We can write whatever story we want to write in the time we have. We are all writing out books. And how we use our time depends on whether that book is a smash hit. Or one you want to put back on the shelf. The best thing for us to do is internalize this fact. And then get to writing out masterpiece. Using all 1440 minutes wisely. All 86400 seconds for the good of creating the life we want. Doing the things we do. Spending time with the people who deserve our time and loyalty. And dying one day from a world of which we used our time wisely. And because of that, have no fear of dying or death. Because we actually LIVED. And if one has truly lived, fear of death has no meaning at all. 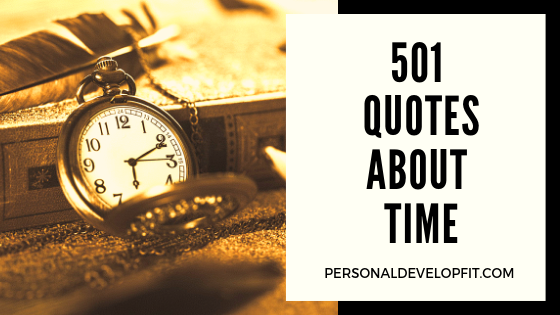 Below are quotes about time that will hopefully inspire us all to truly seize the day. And life our time here to the fullest. “Time itself is neutral, it can be used either destructively or constructively. More and more I feel that people of ill will have used time much more effectively than have the people of good will.” – Martin Luther King Jr. So there we are my friend. 501 Quotes about time. I hope you resonated deeply with some of them. And this article inspired you to use your limited time here on earth wisely. Share with my what your favorite quotes were. Along with one’s you have to add if I missed any of your favorite time quotes! Along with sharing with the group what you intend to do with your life left here on earth!